You may remember our report on a new wave of counterfeit Apple Stores operating in Kunming, China where employees sold authentic Apple products believing they were under the employ of Apple. A new report from the Wall Street Journal’s China Realtime Report casts fresh insight into the unofficial stores, suggesting that not only are staff well aware of their employers status but also care about selling “authentic Apple products, [where] customers don’t complain about the quality”. Whilst the store manager would not comment, the WSJ was able to contact an employee who commented that “it doesn’t make much difference for us whether we are authorised or not”. It is not clear from where the authentic products were sourced. With demand high in China, some of Apple’s products are sourced via official means and then resold but many are bought overseas and then smuggled into the country. In some cases, counterfeit devices are sold. “I think in Yunnan, our store should be one of the best in terms of scale and the level of professionalism,” a Kunming salesman said. 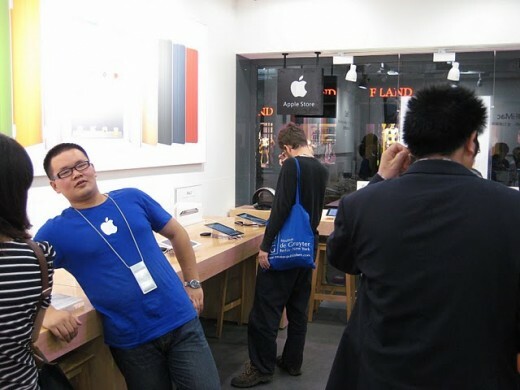 Staff wear the distinctive blue t-shirts assimilating the employee uniform worn in official outlets, adding Apple lanyards to complete the experience. In the In the Kunming store, it even has a circular staircase. The Chinese stores could apply for official reseller status but given the exposure and disregard for official means of operation, Apple’s lawyers may have a fun time shutting the outlets down.